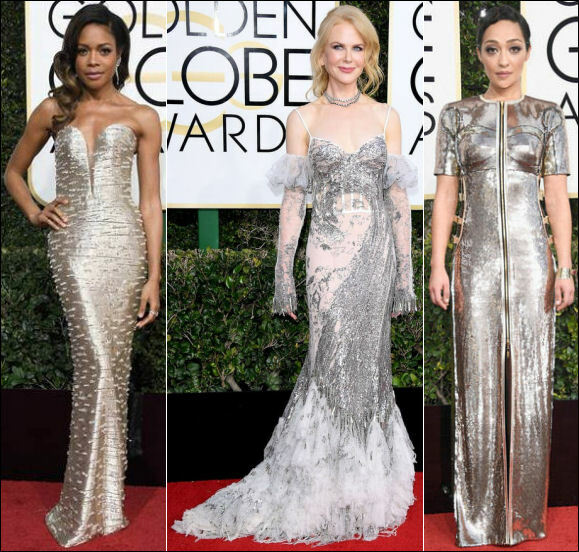 Rarely do we see Fall trends spill over onto the red carpet, but that was the case at the 2017 Golden Globe Awards, where we saw cut-out shoulder dresses. Of course, who else but the always trendsetting Sarah Jessica Parker showed off this look on the red carpet. Also, check out all the other red carpet dresses! Heidi Klum posed in a form-fitting J. Mendel strapless dress. Julia Louis-Dreyfus wore a black and white sleeveless dress Edition by Georges Chakra and Chopard diamond cuff bracelet. Janelle Monae showed off her legs in a cap-sleeved Armani Prive polka-dot dress. Winner Sara Paulson took home her Golden Globe in a long-sleeved Marc Jacobs gown. Priyanka Chopra wore a long-sleeved Ralph Lauren v-neck gown. Kerry Washington in a short-sleeved Dolce and Gabbanna gold dress. Felicity Jones wore a pink embroidered Gucci dress. Lola Kirke wore a strapless Andrew Gn pink embroidered gown. Claire Foy took home a Golden Globe award in a pink sequin gown by Erdem. Sarah Jessica Parker wore a white Vera Wang gown. Presenter Drew Barrymoore shimmered in a Monique Lhuillier dress. Sofia Vergara wore a body-hugging Zuhair Murad embroidered gown. Zoe Saldana in a ruffled two-toned pink Gucci dress with a large bow at the waist. Carrie Underwood wore a pink Iris Serban ruffled neck dress. Kelly Preston wore a ruffled Christian Siriano printed dress. Nominee Naomi Harris showed off her curves in a silver Armani Prive dress with crystals. Nicole Kidman wore a silver Alexander McQueen dress with train. Ruth Negga stood proudly in a short-sleeved Louis Vuitton floor-length silver zipper dress. Sienna Miller wore a white Michael Kors short-sleeved cut-out dress. Gillian Anderson in a white Jenny Packham halter gown and Buccellati cuff bracelet. Issa Rae was all smiles in a Christian Siriano mock neck long-sleeved white gown. Emily Ratajkowski slipped into a yellow Reem Acra side-slit dress. Reese Witherspoon showed off a little leg in a yellow strapless Atelier Versace dress. Viola Davis took home her Golden Globe in a one-shoulder Michael Kors dress.